Bowser has big plans to marry Princess Peach, and is swiping everything he needs for the big day from around the world. Stranded in a mysterious land, Mario meets Cappy, whose sister Tiara was kidnapped. 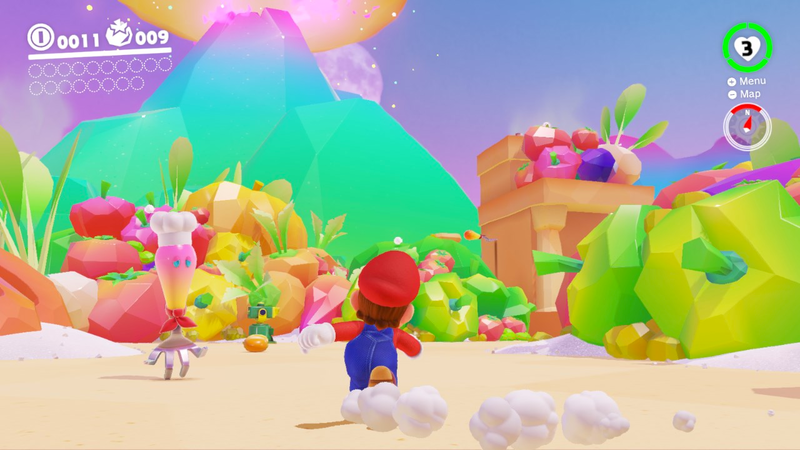 Together, Mario and Cappy gather as many Power Moons as they can to power their flying transport, the Odyssey, and travel the globe in pursuit of Bowser. Use Cappy's powers to cap-ture other creatures, taking control of them and using their special abilities. Explore huge sandbox worlds and track down hundreds of Power Moons. Face Bowser's nefarious wedding planners, the Broodals. Collect a huge selection of hats, outfits and souvenirs from Crazy Cap stores all over the world.